Or so that’s what I think. 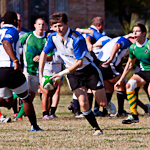 I went this past Saturday down to Galveston, Texas, where I watched the Katy Barbarians play against the Galveston Rugby Football Club. I found myself, as the action warmed up, wanting very much to be back on the pitch, mixing it up with the opposition, supporting my teammates as another ruck is formed. That I suppose is what I mean by “revisiting your past”; the tightness of what you can shoot, and the intimacy of viewing zoomed images while you’re shooting them makes you almost feel as if you’re part of the game. So for me, it was like playing again, but without all the pain. Or so that’s my story, and I’ll stick with it. I really had a great time, and can’t wait to get out to another match sometime soon. This entry was posted on Monday, November 22nd, 2010 at 8:09 pm. It is filed under Uncategorized. You can follow any responses to this entry through the RSS 2.0 feed.